Snudden Farms, a CAFO in Walworth County, was showcased during the 2016 Wisconsin Farm Technology Days. WUWM's Susan Bence looks into whether large dairy farms can maintain a healthy environment. Water is central to the cow business — from the feeding of cows to milking. And lots of cows produce lots of manure. It must be stored and then transported and spread onto fields. Vir-Clar Farms' milking parlor, which is outside of Fond Du Lac. Steve Eatough, who's from Door County, shared with Beats Me his concern that mega-dairies puts Wisconsin’s waters at risk. Denise O’Halloran lives near a mega-farm in rural Jefferson County, near the Rock River. In the 1950s the family milked 50 cows. The farm evolved, has a CAFO permit and is now home to more than 2,000 cows. O’Halloran is part of a group of neighbors who have multiple concerns about how the watershed they share could be impacted. The large farm in rural Jefferson County, near the Rock River, that Denise O’Halloran lives near. Wisconsin’s Department of Natural Resources is responsible for issuing CAFO permits and monitoring the operations. Brian Weigel, deputy director of watershed programs, says the agency is tuned into the potential water risks. “We look at the geology of the area — of the local facility — and understand whether or not there is a high risk of pollutants to the groundwater and in situations where we suspect there might be greater risk then ask the facility to implement a groundwater monitoring plan and report to us regular — on an annual basis — results from that monitoring,” he says. 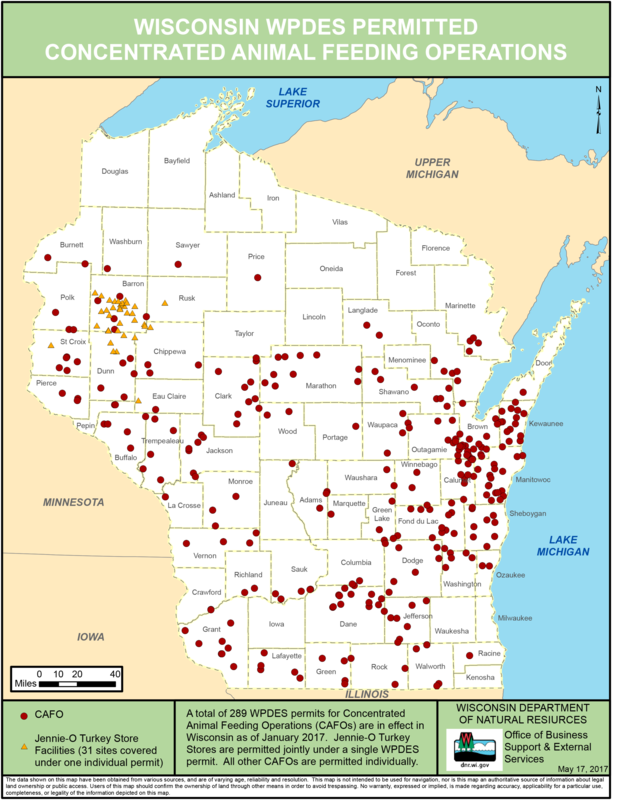 The location of CAFOs in Wisconsin as of May 2017. Weigel says DNR oversight includes managing run-off on the farm and says inspectors visit fields where manure produced by the mega-dairy farms is spread. “That happens on a regular basis with manure haulers, because they may not own the farm who is applying the manure. They have to know the rules, including setbacks — the distance from municipal or private wells, navigable streams and other conduits to ground water,” Weigel says. The big picture? A CAFO permit lasts five years, during which the farmer must submit annual reports. In the fourth year, Weigel says the farms have to meet “substantial compliance” to renew their permits. “If there are allegations of discharge, there could be a notice of violations, fines. A settlement can result in concert with the Department of Justice. It has occurred,” Weigel says. Waukesha County resident John Koepke is a fifth-generation dairy farmer. “It’s a little concerning for me when I hear all CAFOS are bad. Whenever we stereotype like that we set ourselves up for trouble,” he says. "It's a little concerning for me when I hear all CAFOs are bad. Whenever we stereotype like that we set ourselves up for trouble," says John Koepke, a fifth-generation dairy farmer. Koepke’s farm is not a CAFO. His family milks 350 cows. “They’re more regulated than I am as far as when they can apply manure to fields and that sort of thing. And the regulations are very restrictive,” Koepke says. He believes regardless of regulations, most farmers want to do what’s best for their business and the environment, yet, "I think you will find good actors and bad actors across the whole gamut of farm sizes ... But if you have a bad actor out there that’s large they have the potential of having a large negative impact,’ Koepke says. We asked Dairy Business Association to weigh in on this story, but it politely declined. 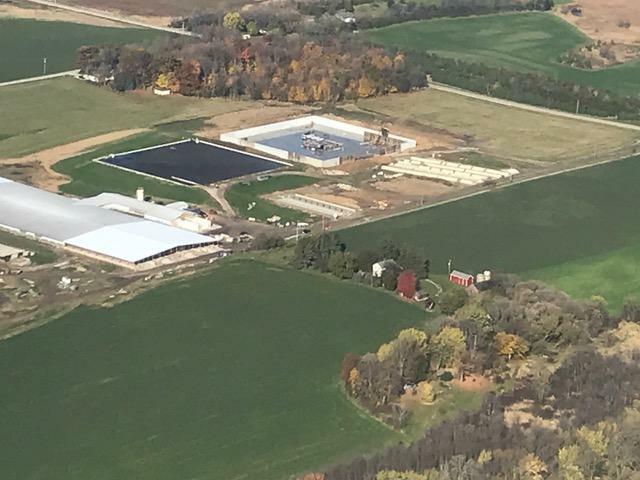 Some people believe the best way to prevent potential negative impacts of CAFOs and ensure safe water for future generations is through a long-term comprehensive water plan for the state. Perhaps Wisconsin will step in that direction. In his first State of the State Address on Jan. 22, Gov. Tony Evers proclaimed 2019 will be the year of clean drinking water. On Tuesday with a 5-2 vote, the Wisconsin Supreme Court removed a regulatory hurdle that was holding the Wysocki Family of Companies back from creating a large scale dairy. This type of operation is commonly called a CAFO, or a concentrated animal feeding operation. The vote comes after five years of heated debate. The company wants to create Golden Sands Dairy just south of Wisconsin Rapids in the Town of Saratoga. The Wisconsin River flows along its western edge. Oconomowoc sits about 30 miles west of Milwaukee and falls within a lake and stream-rich 8300-acre watershed . It falls within the massive Rock River basin. Stretches of the system are subject to an abundance of phosphorus, too much of it, which leads to algal bloom and loss of aquatic life.